A buddy of mine has some land around his house in hinds county and he has always told me about the turkeys that they see during deer season. He wanted me to take him and his 12 year old son who has never been turkey hunting. Well we got to a spot on the edge of a big field at about 630 and one finally sounded off at about 645.We ended up hearing about 5 or 6 birds but all of them was a long ways so we started making our way further down the road. I got some hens fired up and ended up calling one of them up that didnt like my decoy at all. It was a good experience cause the kid got to hear almost every sound a hen can make. She finally left and we were making our way down the road and got to a small food plot with some big woods on one side of the road and pines on the other. I hit the crow call and he let loose only about 100 yards out. I stuck the decoy out and we backed up about 25 yards. The only call I could get him to answer was my primos lil heartbreaker. The bird come through the pines behind us and spooked but as he was leaving I yelped and he gobbled and went into strut. He got on the road and followed the road all the way to us and Matthew let him have it at 27 steps. Matthew thought he was only shooting a 20 gauge until he pulled the trigger and he fell flat on his back and the gun landed beside him but of course he didnt feel a thing. 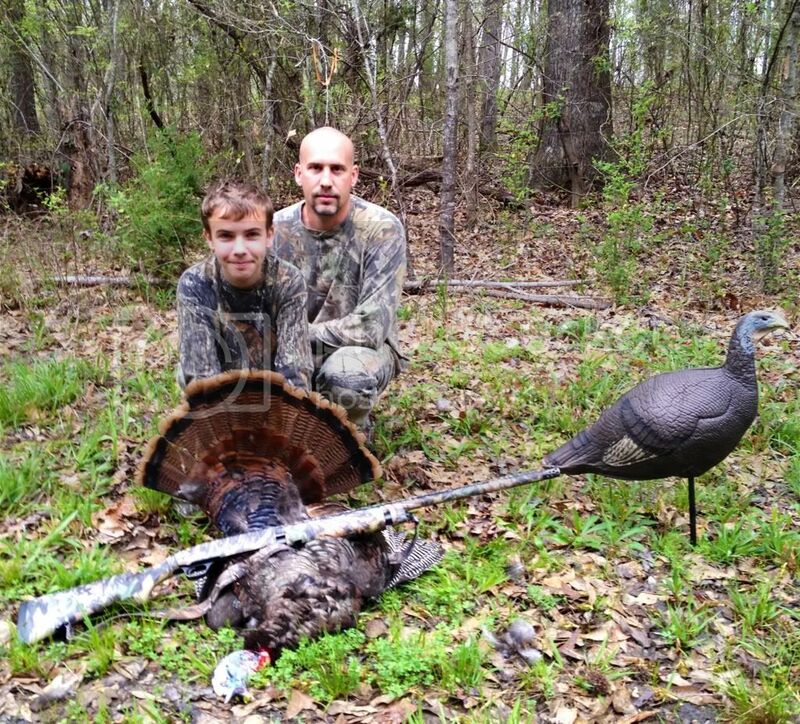 Bird had about a 4.5-5" beard and about .5" spurs. 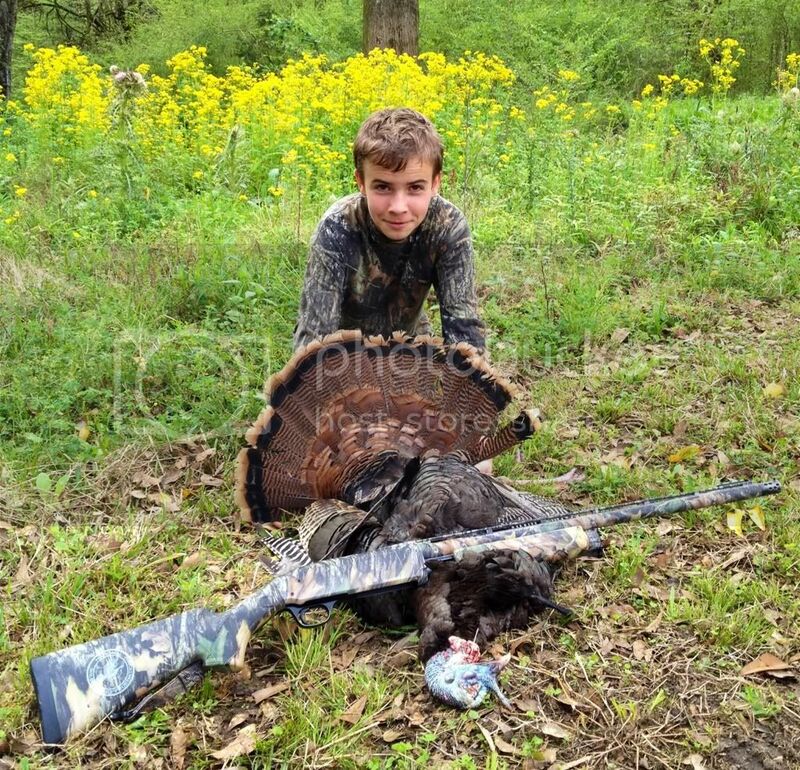 If I dont kill another bird all year I will not complain cause that boy had the time of his life and we will never forget it.